The global military parachute market has great potential to grow with an estimated CAGR of 5.92% from 2015 to 2020. This report provides qualitative and quantitative information about the global military parachute market. It identifies the market application gaps, emerging technologies, the need for new product launches, and high potential geographic regions and countries. It also provides a segmentation of the market, tracking the market size, market share, revenue projections, and financial portfolio, covering a broad spectrum of the different types and application of parachute technologies. 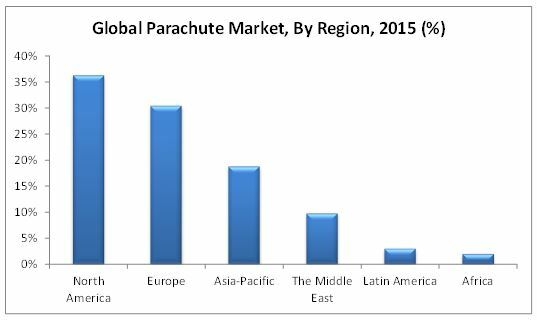 The global military parachute market is valued at USD 910.50 Million in 2015 and is projected to reach USD 1.21 Billion by 2020 at a CAGR of 5.92%. The market is segmented by application, by component, and by type. As compared to other mechanisms during small war contingency operations, airborne forces play a pivotal role by jumping in a battalion or brigade in a moment’s notice and being operation ready overnight. Other alternative units will require an airstrip, equipment loading capabilities, and helicopters in such situations, that may take a week or two. The market size estimations for the various segments and subsegments of this market were arrived at through extensive secondary research, corroboration with primaries, and further market triangulation with the help of statistical techniques using econometric tools. Several nations have engaged their RDT&E activities towards various emerging applications of parachutes, which strongly highlight the market dynamics of parachute industry. The forecast is towards potentially more airdrop applications with gliding and non-gliding parachute operations. The demand for troop parachutes and aerial delivery would become a necessity that drives the need to develop and produce more parachutes which are lightweight and have high load carrying capabilities. In a nutshell, this research report is consolidated business intelligence on the military parachute market. It will also help the parachute industry, and its stakeholders to identify hot revenue pockets in this market. The global military parachute market is estimated to register a market size of USD 1.21 Billion by 2020, witnessing a CAGR of 5.92% from 2015 to 2020. The bulk of the demand for parachutes has been propelled by its deployment for military activities with defense sector being the largest consumer. The growth in demand for parachutes will further be aided by the increase in rate of conflicts globally, increasing use of UAVs for ISR activities, and increasing use of parachutes for recreation. The growth will further be aided by technological advancements such as the use of lightweight fabric, incorporation of GPS systems, drogue chutes, and recovery parachutes. Military and cargo are the two key application segments considered in the market study. The military segment dominated the overall military parachute market as of 2014. The sports application segment is projected to grow at the highest CAGR during the forecast period of 2015 to 2020. The countries in North American and European regions have been involved in several activities to strengthen their military forces, mainly with the objective of being battle-ready. This battle-readiness demands adequate number of paratroopers. Parachutes have made it possible to deliver supplies and equipment to soldiers in warzone. Combat drop and search & rescue operations can be carried out effectively on land and water with the help of parachutes. Among the parachute types covered in the report, the round parachute segment dominates the parachute type market. In military, round parachutes find their application mostly in ejection seats, cargo, and drogue chutes. These parachutes are also used in civilian applications such as aircraft recovery systems and parasailing. The market for round parachutes will witness high growth rate in the Asia-Pacific region owing to the increasing expenditure on enhancing the air supremacy by countries such as India and China. The ram-air parachute segment is projected to grow at the highest CAGR during the forecast period. Airborne Systems is a key manufacturer of ram-air parachutes in the North American region, and is expected to dominate the ram-air parachutes market. The U.S. military uses Military Free Fall Advanced Ram-Air Parachute Systems (MFF ARAPS). It replaced MC-4 systems with MFF ARAPS. In the U.S., a ram-air parachute system implementation project for the U.S. forest service is underway. Matured markets such as North America and Europe invest heavily in development and procurement of technical textiles for recovery and troop parachutes. Emerging markets have faced slower recognition of parachutes and their potential benefits due to lack of funds and awareness. Development in these markets is expected to speed up during the forecast period as they offer several untapped and unexplored opportunities. The growth of the military parachute market may be, however, affected by certain major restraints in coming years. These factors include the stringent government procedures as the manufacturers of parachute and parachute systems face difficulty in adhering to the strict procurement and inspection procedures laid down by government. The global military parachute market is diversified and competitive, with the majority of players from the North American and European regions. The market is dominated by companies based on their core competencies. Key players in this market include Airborne Systems (U.S.), Mills Manufacturing (U.S.), Butler Parachute Systems (U.S.), Spekon (Germany), FXC Corporation (U.S.), and CIMSA Ingenieria (Spain). 12.3 Cimsa Ingenieria De Sistemas, S.A.
12.8 Butler Parachute Systems Group, Inc.